Women now make up 20% of both the House and Senate — a record high for the U.S. Congress. But that figure pales in comparison with most of its high-income peer nations — and lags even farther behind most lower-income nations around the world. 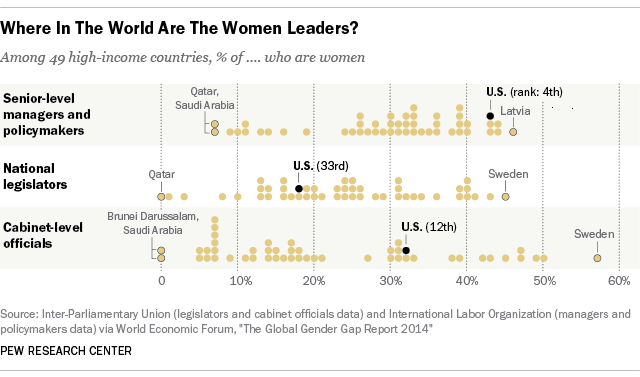 As part of the Pew Research Center’s examination of women and leadership, we analyzed how the U.S. stacked up against other nations in terms of women in key government posts and other senior positions. We consulted the World Economic Forum’s “Global Gender Gap 2014” report, the latest in a series of studies examining the state of gender parity on more than a dozen different parameters. The only country with more female legislators than males was Rwanda: 51 of the 80 seats in the Chamber of Deputies (64%) are held by women. Following Rwanda in the WEF standings were Cuba, Sweden and South Africa (although, according to more recent data from the Inter-Parliamentary Union, Bolivia and Andorra now are in second and third place). The WEF also drew on data from the International Labor Organization to rank countries on the ratio of females to males among “legislators, senior officials and managers,” a broad occupational category that includes lawmakers and other government policymakers, corporate managers, and top officials of unions, political parties, special-interest groups, nonprofits and other such organizations. Among the 125 nations with available data the U.S. was tied for 16th (with Namibia); but among high-income countries the U.S. tied for fourth place, with Barbados and Trinidad and Tobago. Women have served as heads of state (or heads of government, in nations where that’s a separate office) at some point over the past half-century in 63 of the 142 countries studied by the WEF. India leads the list, with women as either president or prime minister for 21 out of the past 50 years (Indira Gandhi was prime minister for a total of 16 years between 1966 and 1984; Pratibha Patil served as president from 2007 to 2012). At the other end of the spectrum, Cécile Manorohanta was Madagascar’s prime minister for two days in December 2009. Still, that’s more than the United States, where no woman has ever held the presidency. However, in a recent Pew Research Center survey, 73% of adult Americans said they think the U.S. will elect a female president in their lifetimes. That sentiment transcends gender and party lines: 75% of men and 72% of women said they expect to see a female president before they die, as did 85% of Democrats, 64% of Republicans and 75% of independents.